Joe Cain hot sauce honors the man who brought America's oldest Mardi Gras back to life following the Civil War, and it does so with delightful habanero heat mellowed with carrots, vinegar, and spices. 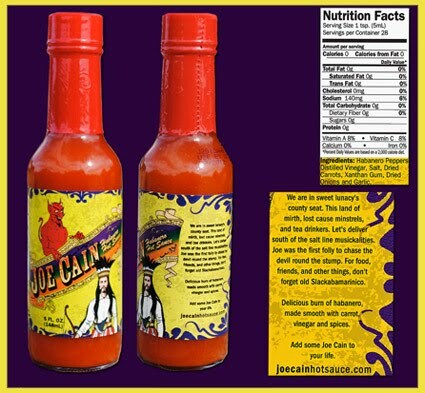 Joe Cain hot sauce is a delicious tribute to Mobile Alabama, Joe Cain, and Mardi Gras. It is hot, fiery, and full of passion, but it is an everyday sauce, that anyone with a love of natural Habanero Hot Sauces will enjoy. True, it is hot, but its not absurdly hot. Hotter than the standard sauce out of Louisiana, but it's not one of those gimmicky chemical sauces, this is pure, natural heat, with a flavorful expression of habanero and a delightful melange of spices. A great everyday sauce. Ideal for southern favorites and all delicacies popular south of the salt line and all along our languidly lovely Gulf Coast. Put some Joe Cain into your day by adding this great sauce to most any dish. It is the hot sauce of of choice for celebrations both symbolic and institutional, flavors most suitable for red beans and rice, shrimp of any sort, most chickens, some pork, and should be added to several alcoholic beverages. It is delicously spicy and gives a pleasant enhancement to many foods. I think you would be remiss if you did not purchase some. I enjoy eating it on chips.